We will use snow-covered land as a big canvas and draw a gigantic flower together. We will sprinkle biodegradable paints, petals, colored paper, all over the snow. When we are done with our creative process, we will gather together on top of a tall building or a hill to enjoy the picture on the white snow canvas. Everyone in town will be invited to our very original ohanami (flower blossom viewing) in the winter wonderland. The colors of the flower will fade and change with each snow fall as we watch. The materials will freeze as they get covered with additional snow, only to be re-discovered again as the spring approaches and snow melts. Hisako Inoue is an artist and the representative director of “Shimauma Kirin,” an organization that hosts workshops for children and interactive activities with the elderly persons in Ishimaki, Miyagi prefecture. Artist for a Day plans to collaborate with Hisako Inoue and Shimauma Kirin to host a workshop. Shimauma Kirin started its activities after the earthquake with an objective to care for the mental and physical health of the children in Tohoku area. 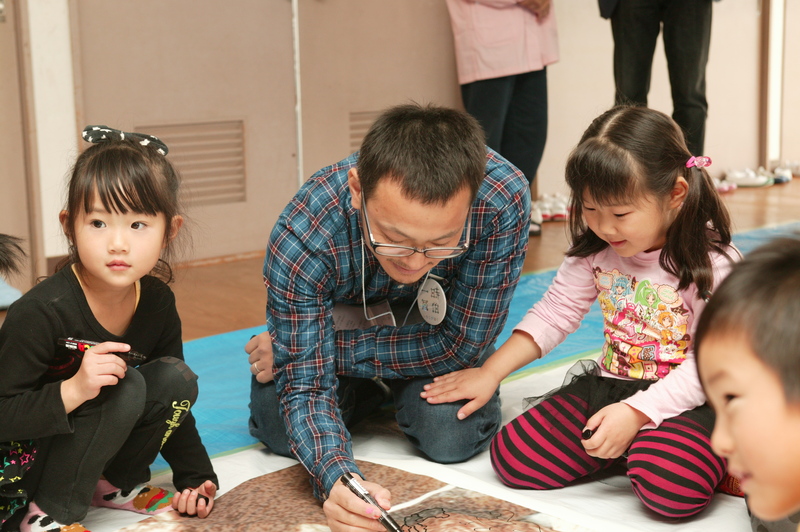 Since May 2011, the organization liaised with the local non-profit “Nijiiro Crayons (formerly known as Ishinomaki Children’s Refugee Center”) and visited three shelters every month to host indoor workshops and outdoor activities for children. In addition to the above workshops, if you are interested in sponsoring any of our previously hosted workshops, please let us know.